We know the importance of buying local when it comes to fruits, veggies, meat, and anything else that might need to go on your shopping list – but, what about art? If you’re looking to check a few names off your gift-buying list this holiday season, local artists encourage you to come out next weekend for the 2018 Aurora Artists Studio Tour. Twelve local artists will fan out to five different studio locations around Aurora on Saturday, November 24 and Sunday, November 25, inviting you in to not only see their creativity in full bloom, but also see the best of what area artists have to offer. Among the artists participating in the Artists Studio Tour this year is Campbell Sampson, who took up painting just a few years ago as a hobby and has been amassing a steady following ever since. “It started off as a hobby and I never expected to be part of something like this,” says Mr. Sampson. “I am a rookie, self-employed in the fire protection industry, and this is something I just happened upon. When you’re self-employed, you get bogged down in the same old same old, so I thought I would try painting. My wife said sure and we put up space in the basement. Mr. Sampson, an Aurora resident, hails from the United Kingdom and has called Canada home for the last 25 years. His experiences are reflected in his art and, in turn, he wants viewers to find something “interesting and different” in his work. 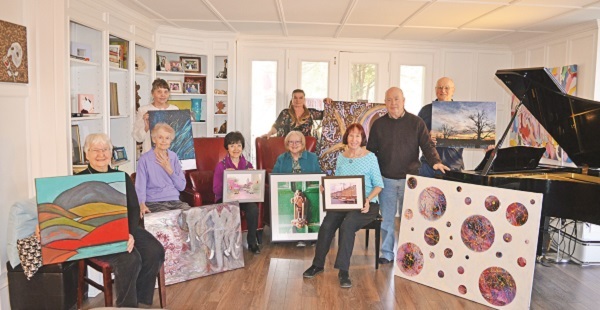 Another first-timer on the tour is Vikki Mikkola, who was introduced to the tour through its participation in the Aurora Historical Society’s series of “Art at the Manor” exhibitions at Hillary House. A member of SOYRA (Society of York Region Artists), Ms. Mikkola describes her style as abstract landscapes. Artists on the 2018 Artist Studio Tour, a self-directed tour that is free to all patrons, include Carol Beaver, Judy Bobsin, Deborah Campo, Claire d’Aurore, Colin Emsley, Philippa Hajdu, Jim Jackson, Amy McNeill, Vikki Mikkola, Willo Rodrigues, Campbell Sampson, and Christine Valentini. For more information on the tour, including times and studio locations, visit www.aurorastudiotour.com.